Stunning 3 year old ranch featuring 3 beds, 2 full bathrooms, vaulted ceilings, premium lot backing to trees/woods, walk-out basement and stand out custom features inside & out. Beautiful exterior with stone accent & contrasting entry door. Great room opens to eat in kitchen & breakfast room making entertaining a cinch. Kitchen features custom cabinetry, dual farm house sink, center island with overhead lighting, double door pantry, & SS appliances. Breakfast room with bay windows & atrium door walkout to the back deck. Master ensuite features a walk in closet & private bath w/adult height oversize vanity, linen closet and oversize shower. Secondary bedrooms provide double door closets. Hall bath with designer vanity & shower/tub combo. Main floor laundry room. Back exterior offers 18X12 Deck, 21X16 lower patio & backs to trees. 2 car oversize Garage. Subdivision pool & more. 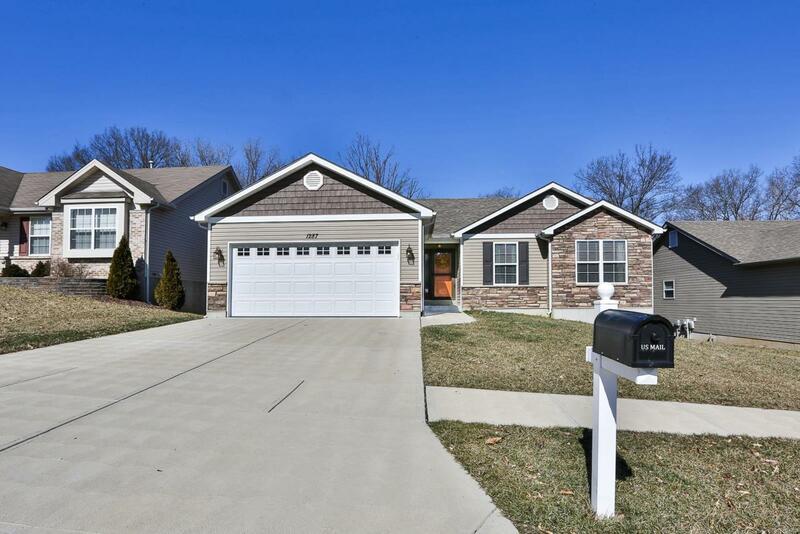 First showings at open house Saturday 3/16 from 12-2pm.